I've got something to tell you. No, it's not that I'm obsessed with peanut butter - I think that's pretty obvious... it's that I get really excited over recipes.... I mean really. We have this thing, in the SIL house... it's called the doody dance. Okay, it's my thing (because no one else is weird enough to do it). The doody dance is basically a happy dance on steroids - it happens when something really good happens: an exciting work contract, an awesome opportunity with the blog, a really amazing recipe. 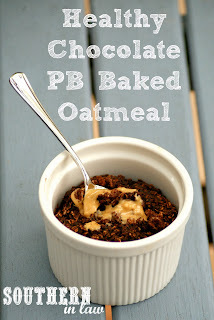 Warm chocolatey baked oats with a gooey, delicious peanut butter centre.... heaaaaaaven. 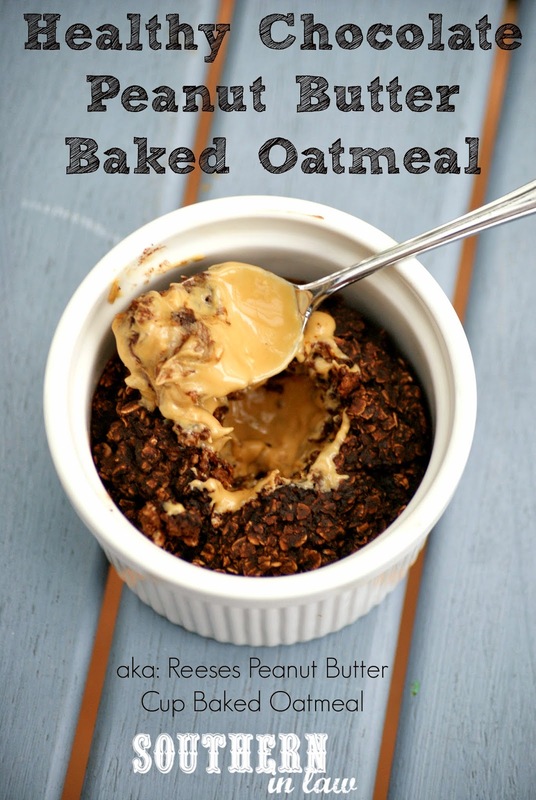 It's like a molten lava cake - only healthy and with a peanut butter centre. This recipe was totally doody dance worthy (and no, I'm not going to show you a video of the doody dance because it's hideously dorky :P). I quickly snapped some photos and stopped myself from devouring it the second I stuck the spoon in -but once I had that first bite? I was in heaven. This baked oatmeal, my friends, is incredible... if I do say so myself. It might be a little odd to get as excited over a recipe as you would a Christmas present that you've been waiting 6 million years for - but hey! I don't hear you complaining when you get to enjoy them too! You see, I spend way too many hours a week developing recipes - It's actually become a professional thing as well as companies have started to do doody dances over my recipes too. I love creating delicious healthy recipes and when I come up with things like this, it's worth every second spent. I teased Southern In-Law Instagram followers (@southerninlaw) with a picture of this a little while ago and the recipe is finally here - and oh how you will want to make this ASAP! 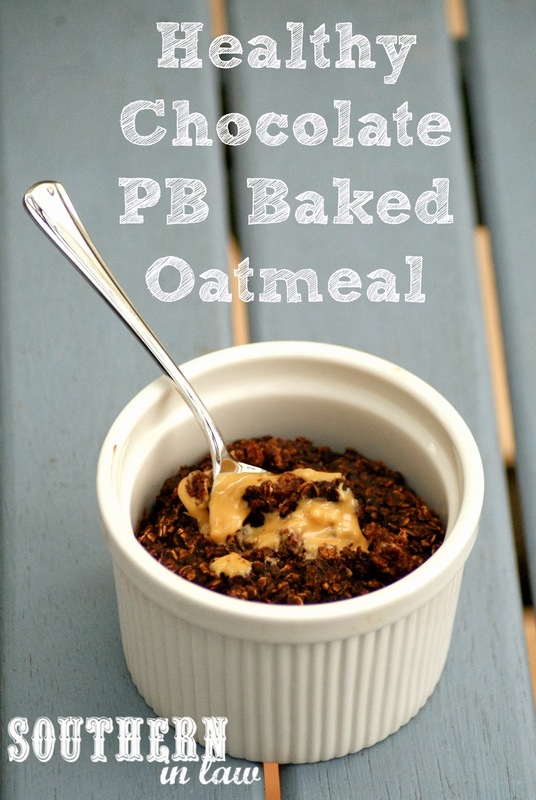 Mix together your oats, baking powder, cocoa powder, salt, applesauce, milk and vanilla (and additional sweetener if using). Pour half of your oat mixture into the ramekin. Next, add in your peanut butter/nut butter and pour your remaining oat mix on top. 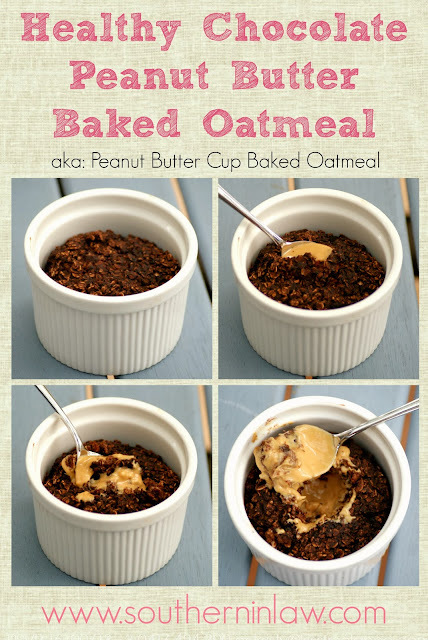 Bake for 20-40 minutes, or until your baked oatmeal is set and firm. Cool slightly (or not if you're impatient like me) before devouring! **The reason I put runny nut butters in the freezer for the recipe is because I found they were easier to work with when firmer - that was you can layer everything and ensure you have a gooey delicious centre. When you're really happy and excited about something, what's your reaction? Is it a happy dance like me or are you a squealer? (I do both) Or maybe something different altogether?! What unhealthy/not so healthy food do you wish you could eat for breakfast? I need a new healthy breakfast recipe challenge so hit me with your best shot!